Sometimes the simple dorm essentials are what pull all of your dorm room decorations together for a complete look. You may want simple, clean designs for all of your dorm necessities right down to your college wall decor. What matters is that your dorm room decor is one that you love and that it makes your college dorm room feel comfortable and like a home away from home. Making your dorm decor comfortable and home-like is one of your most important missions when you're putting together your college dorm checklist. You want to prevent and reduce homesickness as much as you can and making your college dorm room ultra comfortable is what will help you do exactly that. For simple dorm wall art that will add cute design elements to your dorm room decor, our I LOVE YOU College Poster will be a great addition to your college wall decor! Our I LOVE YOU Dorm Poster has such a cute design that will give you plenty of design elements for your dorm decor. 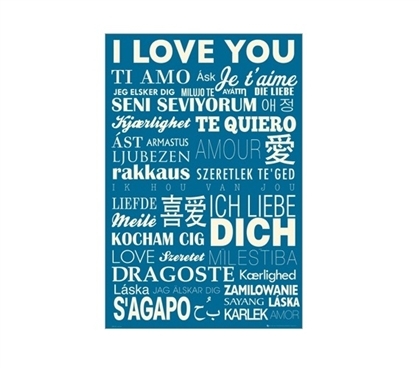 The simple design of this college poster has the phrase "I love you" in different languages in white printing on an aqua backdrop. On top of the already cute design of this college supplies item, each phrase has a different font style to add to your college wall decor even more! This college poster will look especially amazing with white or aqua themed dorm room decor for a complete style. Make your college dorm room decor pop with bright, cute style with our I LOVE YOU College Poster in your dorm necessities!